As we have since July 2006, each Friday we’ll post our sampling of cigar news and other items of interest from the week. Below is our latest, which is the 543rd in the series. 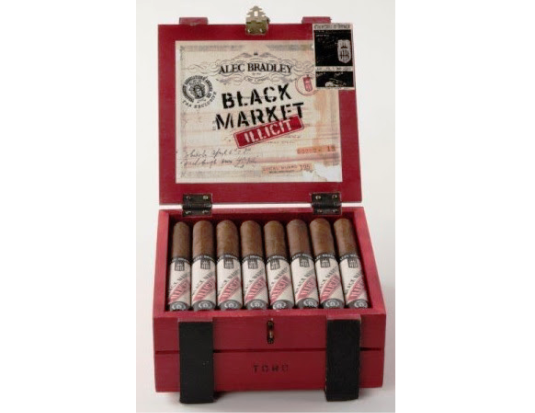 1) Alec Bradley Cigar Co. is shipping Black Market Illicit—an iteration of the Black Market line—to Tobacconist’s Association of America (TAA) retailers nationwide. According to a press release, Black Market Illicit (6 x 50) includes “a robust Nicaraguan wrapper leaf and flavorful Honduran and Nicaraguan dual binders wrapped around fillers from small-yield farms in Nicaragua.” Alan Rubin, owner of Alec Bradley, said, “This is the first exclusive series cigar Alec Bradley has developed for TAA retailers since we introduced the Prensado Figurado in 2013. We like to describe this iteration of our number one-selling cigar as Black Market ‘on steroids.’” Black Market Illicit is packaged in 22-count boxes and will be sold for $8.75 apiece. Each year, some of the industry’s most revered manufacturers craft an exclusive cigar for TAA members, a group of about 80 retailers who pride themselves on their knowledge and professionalism and work together to develop best practices. 2) This week, so-called “public health” groups filed a reply brief in response to cigar plaintiff opposition to anti-tobacco group intervention into a lawsuit challenging the FDA’s deeming rules implementing regulations over cigars. The anti-tobacco groups want to defend and continue the FDA regulations even if the Trump Administration decides to roll them back. As we noted when the groups first filed their motion, it can be viewed as a positive for those opposed to the FDA regulations, a prescient view given the FDA’s actions soon after. 3) Inside the Industry: Drew Estate announced on Monday that, effective August 28, Scandinavian Tobacco Group (STG) Canada will be its “exclusive distribution partner for both domestic and duty-free premium cigar markets in Canada.” Longueuil, Québec-based STG Canada – a subsidiary of STG International which is also the parent company of General Cigar – replaces House of Horvath as Drew Estate’s Canadian distributor. “We are excited about our partnership with STG Canada, and plan to build on the success that we have enjoyed in this tough market over the past few years,” said Alex Goldman, vice president of international business development for Drew Estate. 4) From the Archives: If you’ve ever been tempted to save money and try a cheap, machine-rolled cigar in place of a premium stick, at least do so forewarned. Our “review” of a Dutch Masters Corona De Luxe might make you rethink the value of spending less. 5) Deal of the Week: StogieGuys.com recommends Bespoke Post, a monthly collection of awesome items (think fine bar accessories, shaving kits, wine, workout gear, coffee kits, and more) delivered for just $45. You can skip or purchase every month. Sign up here. Read the archived piece on cheap cigars. I’m sure there are plenty of cheapos that are real stinkers. But not all cheap cigars are bad. My every day go-to cigar is a buck-a-stick smoke from an online retailer. It smokes very well, although it certainly does not have the flavor nuances of a premium stick. That’s a good point, Cigar Seeker. Speaking of cheaper cigars that are quite serviceable, check back tomorrow for my Quick Smoke review of the Maria Mancini Robusto Larga (under $3 apiece).